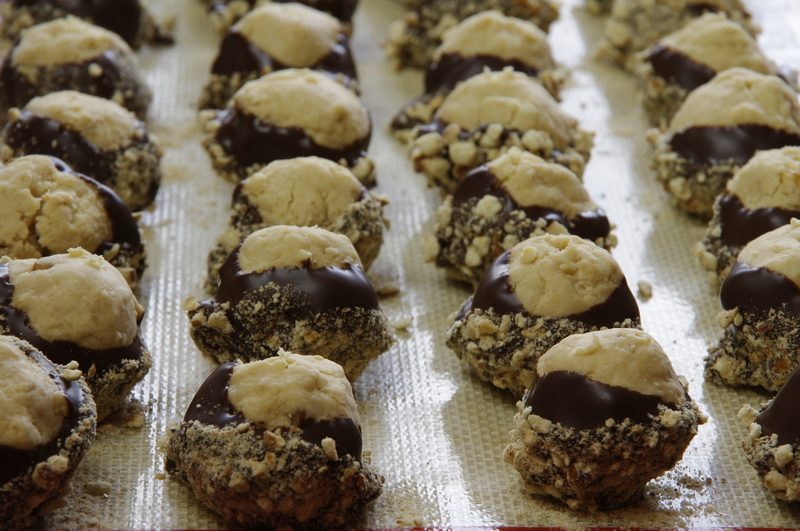 One batch of dough equals three ways to make some delicious peanut butter cookies. Peanut butter cookies are one of my youngest son’s favorite cookies. I am always looking for a way to make them a little different but keep that peanut butter flavor he loves. 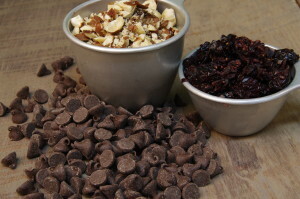 Here is a way to create a variety of cookies and you only have to make one cookie dough. You can make old fashion peanut butter cookies, peanut butter thumbprint cookies and a peanut butter sandwich cookie. I used strawberry jam but you can use any jelly or jam that your family likes, the combinations are endless. If you double the Old Fashion Peanut Butter Cookie recipe below you can make 2 dozen of each peanut butter cookie out of one bowl of dough. The recipe for the old fashioned peanut butter cookie is a good one, I have placed 1st for three years in a row at my county fair! Preheat oven to 350 degrees. In medium bowl combine the flour, baking powder and salt, set aside. In large bowl beat butter, peanut butter and vanilla until combined. Add brown and white sugar and beat until creamy, about 2 minutes. Add eggs one at a time until mixed. Add flour mixture and mix until just combined. 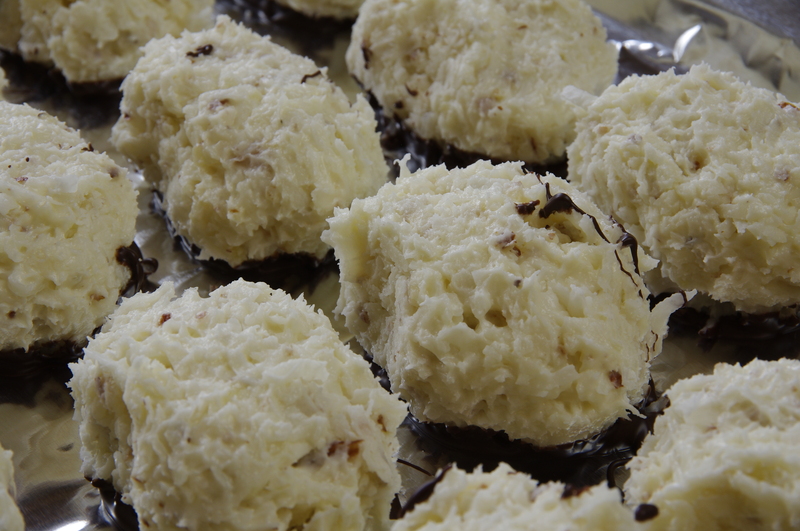 Roll into 1 1/2 -inch balls and then roll in the extra white sugar. Using a fork, flatten cookie and make a criss-cross pattern. Bake for 10-12 minutes or until lightly brown. Let cookies cool on baking sheet 5 minutes and then remove to a wire rack to cool completely. 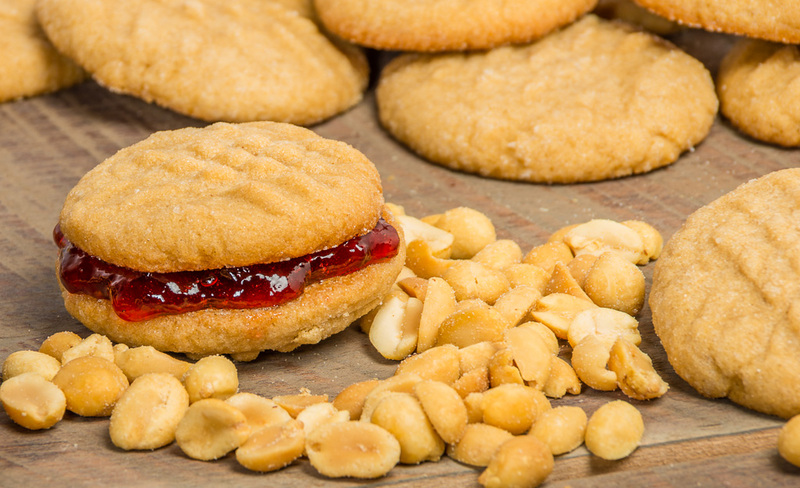 Take two of the baked peanut butter cookies above add 1 teaspoon of jelly or jam on one cookie. 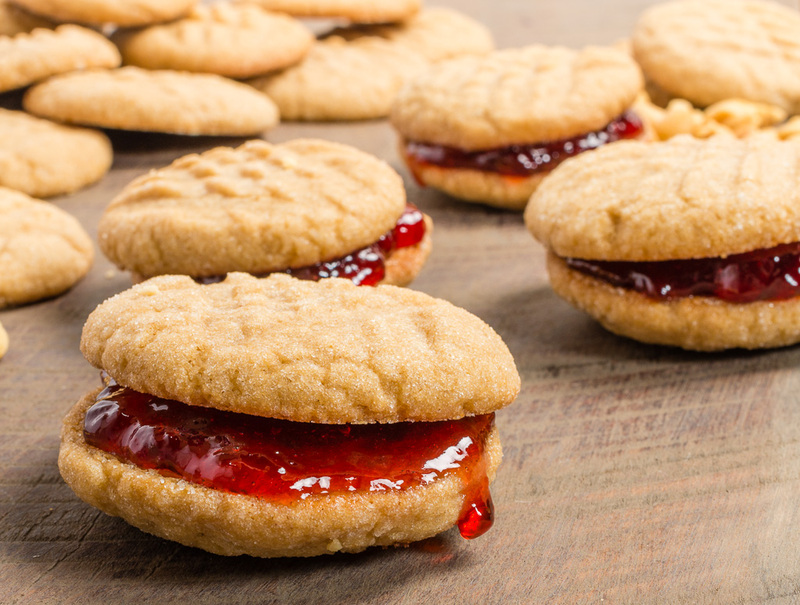 Place second cookie on top and press down to squeeze the jelly or jam evenly inside the cookie. 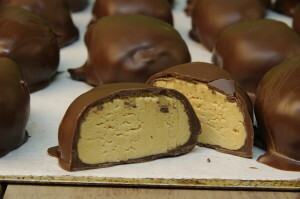 After making the peanut butter dough roll into 2-inch balls. Roll in the chopped peanuts and place on baking sheet. With your thumb make a deep indentation. Bake for 10-12 minutes or until golden brown. Cool on rack for 5 minutes and then remove to a wire rack to cool completely. 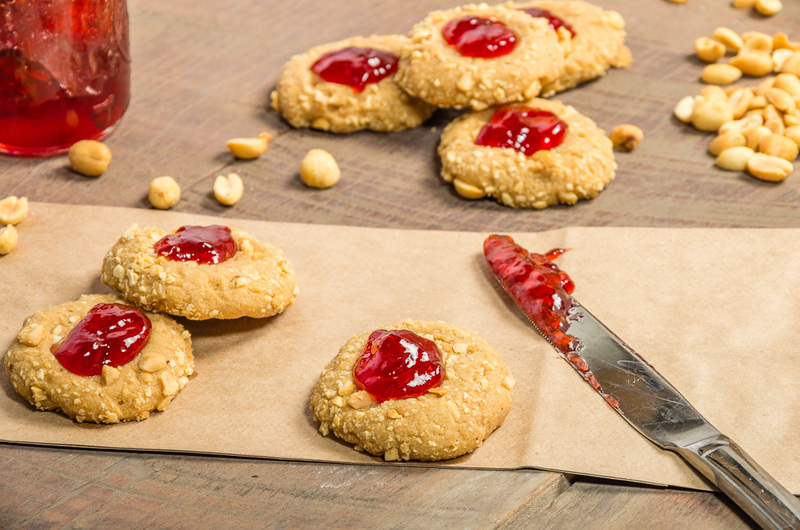 Add a 1/2 teaspoon of the jelly or jam to the center of the cookie. Here is another great recipe I made using Oregon made Wild Friends Honey Pretzel Peanut Butter. 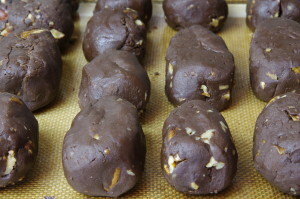 I used my traditional Peanut Butter Buckeye recipes and gave it a Fresh From Oregon twist. 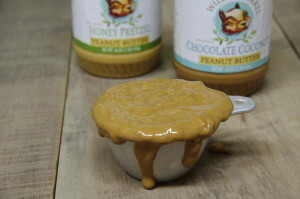 I transformed their Honey Pretzel Peanut Butter into melt in your mouth little bits of heaven. 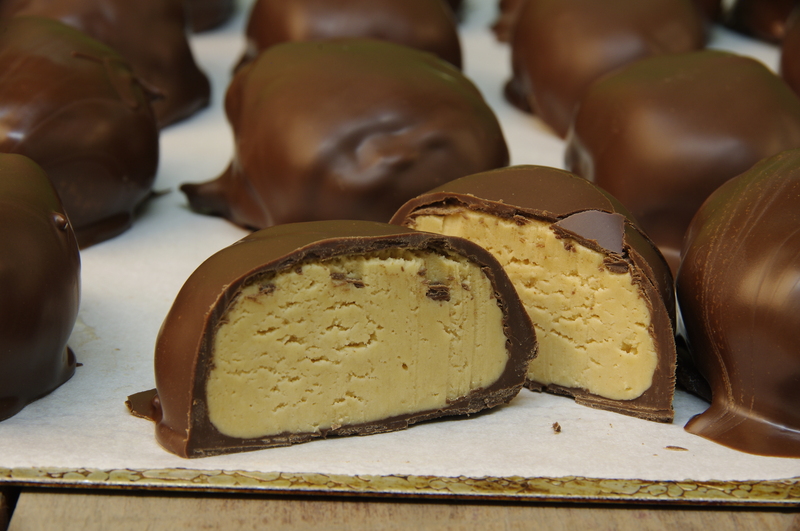 Buckeyes are a peanut butter confection crafted to look like the fruit of the Buckeye tree. In my family these were always in tins at Christmas and on trays at weddings on the cookie table, that’s another blog. In the bowl of a stand mixer combine peanut butter, confectioners sugar, vanilla and butter. 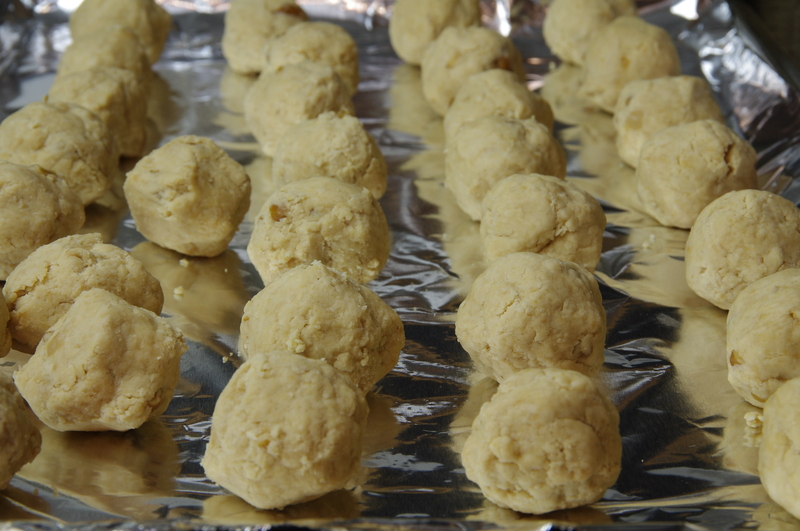 Shape into 1-inch balls and place on a lined baking sheet. Place in refrigerator for 1 hour. Melt the chocolate in a bowl set over simmering water. 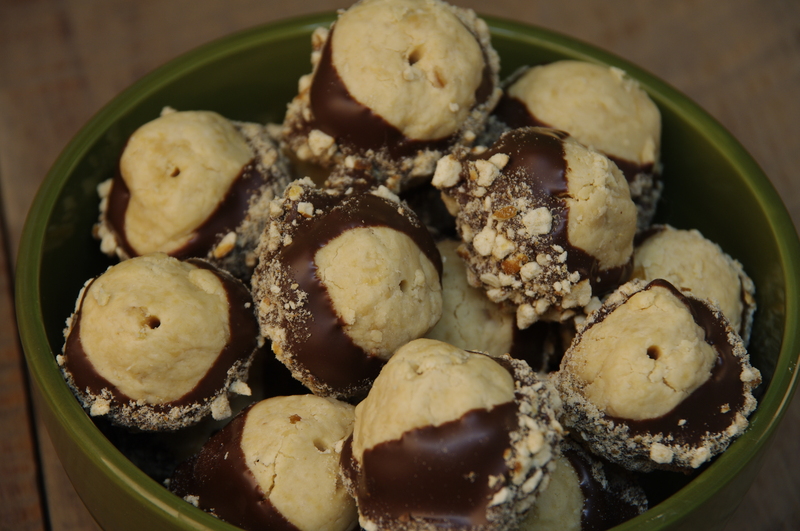 Using a toothpick dip peanut butter ball half way and then roll in the crushed pretzels. Place on foil lined baking sheet until the chocolate is set. Store in airtight containers. With Easter less than a week away… you must be thinking about bunnies, coloring eggs and of course chocolate in the Easter basket. 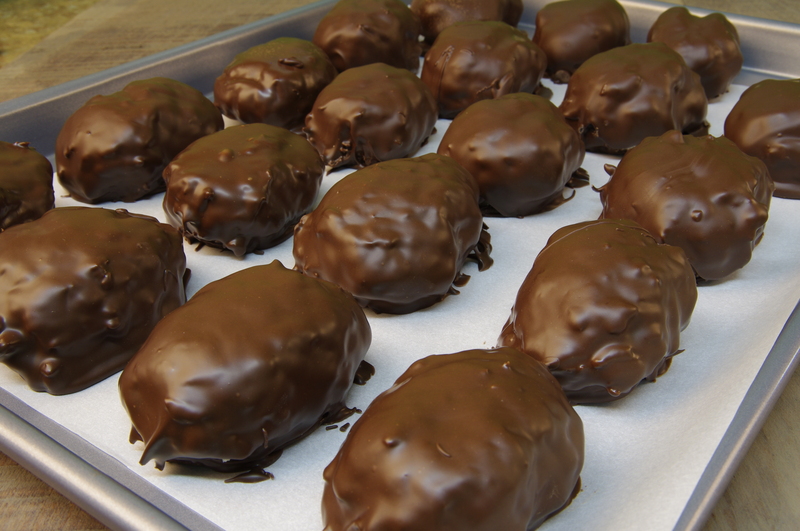 I got my 20# box of chocolate out this weekend and my favorite filling recipes and turned my kitchen into the Easter Bunny’s workshop. I added a new filling this year that is filled with Fresh From Oregon flavors, hazelnuts and cranberries. 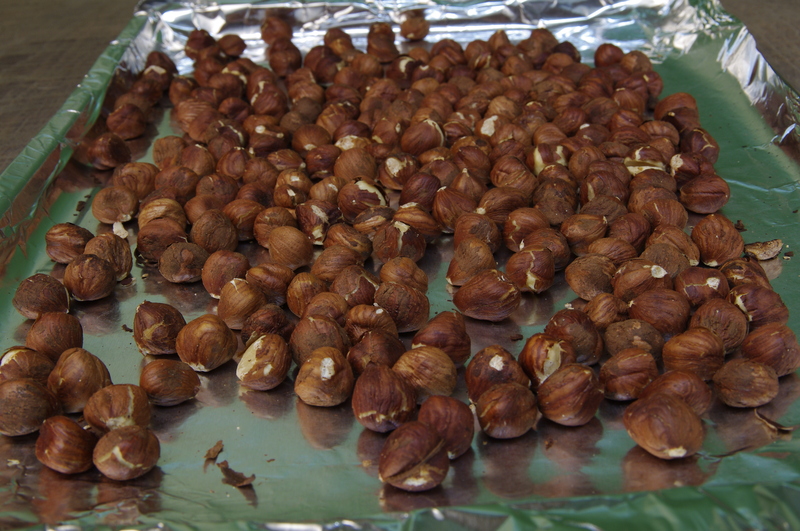 I took some hazelnuts out of the freezer (the best place to store them) and toasted them in the oven at 400 degrees for about 3-4 minutes. I then opened a box of dried cranberries I found the other day while shopping. 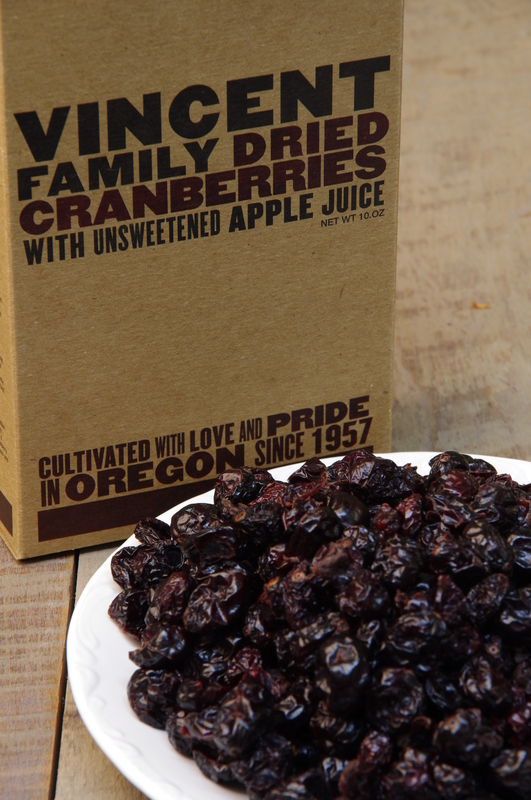 These dried cranberries are grown and produced by the Vincent Family on the Southern Oregon coast, they cultivated their first cranberries in 1957, read more here about their story. So with these two great Oregon flavors and my fudge recipe I created a Hazelnut Cranberry Fudge filling. 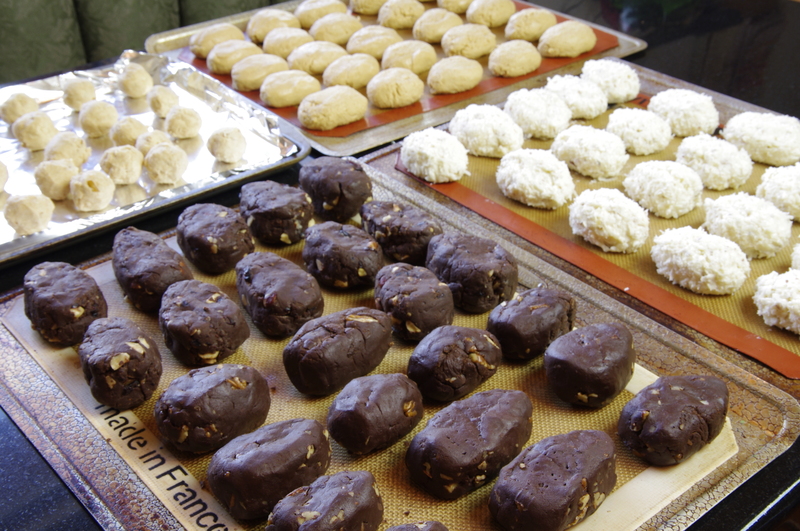 I also made my family’s other favorite fillings: coconut almond, peanut butter and pecan fudge caramel. These melt in your mouth recipes are easy and quick to make and the taste of homemade chocolate eggs will be the perfect surprise for your family and friends this coming Easter. 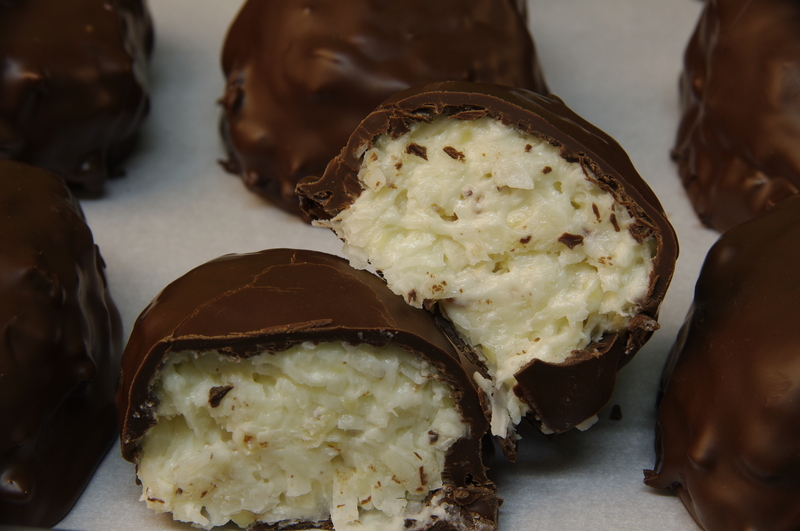 Once you have made your fillings and shaped them into eggs they will be ready to dip in the chocolate. I use a good grade of melting chocolate wafer, Merckens. You can find them at your local stores that sell candy making supplies or order online. It is best to melt in a double boiler or a bowl placed over simmering water. I find it is easier to dip just the bottoms in the chocolate first and let it set, about 10 minutes. Then when you dip the top into the chocolate you will have something to hold onto, the only downside you will need to lick the chocolate off your fingers often. 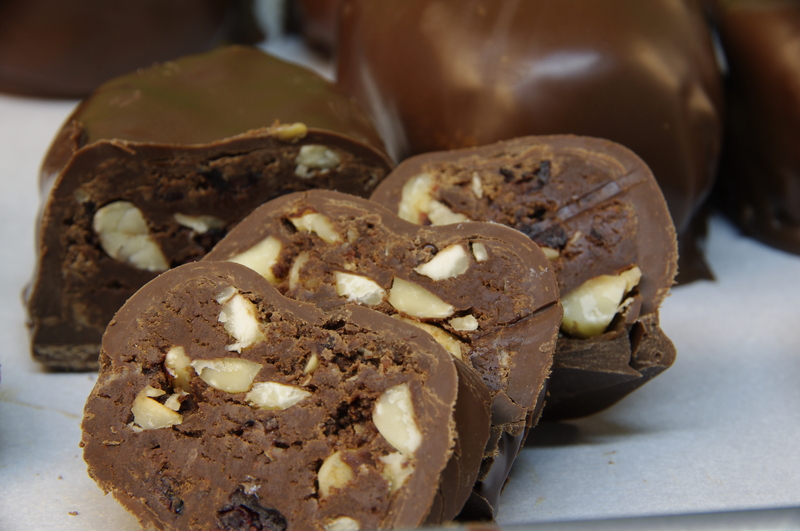 You can also place that set chocolate bottom on a fork and dip it into the chocolate. Remember to place a piece of parchment paper on the pan you will place the eggs on to set the chocolate, this keeps them from sticking to the pan as the chocolate sets. Line an 8-inch square baking pan with parchment paper, allowing extra to hang over the sides and spray lightly with cooking spray, set aside. In a double boiler toss chocolates, baking soda and salt. Stir in condensed milk and vanilla. Stir 2-5 minutes until only a few pieces of chocolate are left. Remove from heat and stir another 2 minutes, the mixture will become a little glossy. Stir in the hazelnuts and dried cranberries. Spread evenly in the prepared pan and let set for 3o minutes. Once cool enough to handle cut into 12 even pieces and make into an egg shape. Place on a parchment lined baking sheet and let set for about 1 hour before you dip them in the chocolate. Cream together butter and peanut butter in the bowl of an stand mixer until creamy. Gradually add the confectioners sugar and mix until combined. Shape into the size eggs you want. In bowl of a stand mixer cream butter and confectioners sugar. Add coconut, condensed milk, almonds and vanilla, mix until fully combined. Chill in refrigerator about 30 minutes and then shape into any size egg you want. 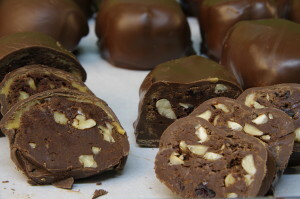 In a double boiler toss chocolates, baking soda and salt. Stir in condensed milk and vanilla. Stir 2-5 minutes until only a few pieces of chocolate are left. Remove from heat and stir another 2 minutes, the mixture will become a little glossy. Stir in the pecans and spread evenly in the prepared pan and let set for 3o minutes. Once cool enough to handle cut into 12 even pieces and make into egg shapes. Place on a parchment lined baking sheet and let set for about 30 minutes before pouring caramel over. To melt caramels unwrap and place caramels and milk in a bowl over simmering water and stir until melted. Pour about a tablespoon of caramel over each egg, if it drips over the side its Ok. Let set 5 minutes and eggs are ready to dip in the chocolate. Some of my Fresh From Oregon dishes do not always come from a trip to the local farmers market for local grown fruits and vegetable but from local Oregon made products. 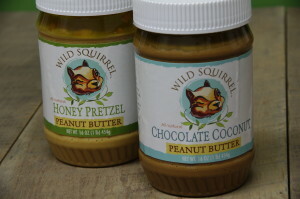 Wild Squirrel Peanut Butter is one of my most recent discovers of Oregon made products. Here is their story “One day, at their apartment in Eugene, Oregon, University sophomores Keeley and Erika were scraping the bottom of yet another jar of peanut butter. With no more peanut butter and a surplus of celery, they were faced with a familiar conundrum. Luckily, they had a bag of raw peanuts, a brand new food processor, and two squirrelly little minds. 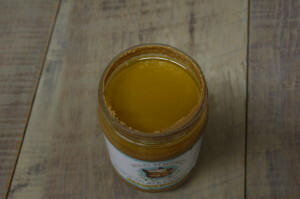 It didn’t take long before they had created a delicious batch of homemade peanut butter.” I picked up a jar of their Chocolate Coconut Peanut Butter and a jar of the Honey Pretzel Peanut Butter to see what I could create. Their other flavors of peanut butter are Cinnamon Raisin and their newest Sesame Cranberry. They also have almond butters, Chocolate Sunflower and Vanilla Espresso. 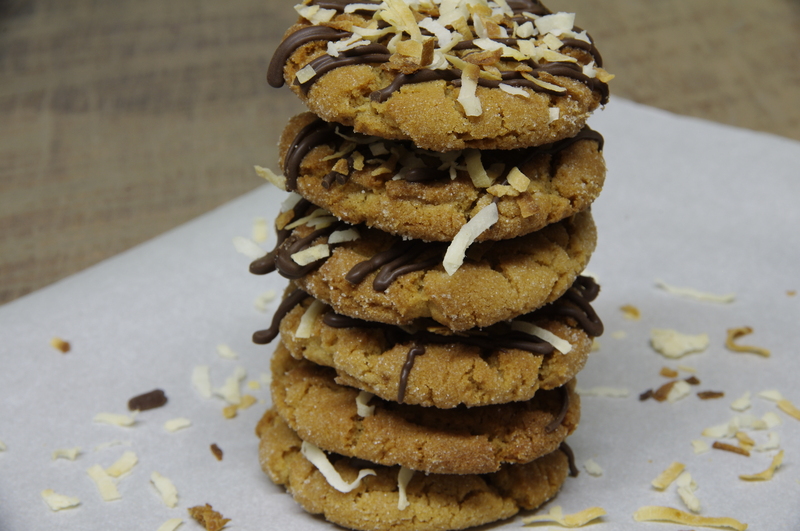 The first thing I wanted to make was a peanut butter cookie and give it a make over with the Wild Squirrel Chocolate Coconut Peanut Butter. 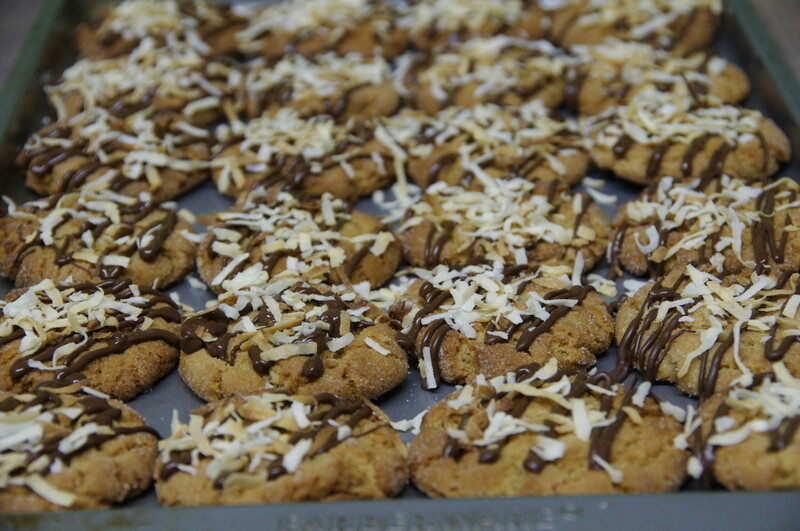 Enjoy the cookies below with a big glass of milk! 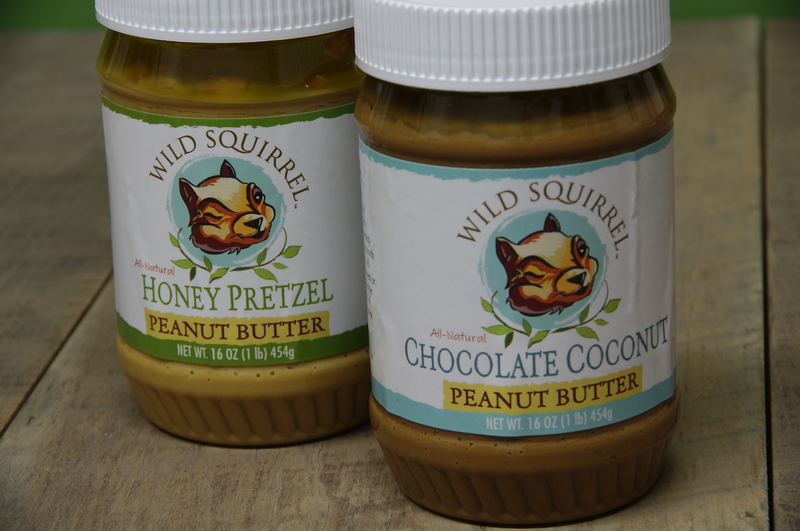 You can find Wild Squirrel Peanut Butters and Almond Butters at these local stores or order online from their website. Preheat oven to 350 degrees. Combine butter, peanut butter, sugars, egg and vanilla in the bowl of a stand mixer and mix until combined about 1 minute. In separate bowl add flour, baking soda and salt and mix to combine. Add to the wet ingredient and mix until fully combined, about 2 minutes. Form into 1-inch balls, roll in the sugar and place on baking sheet, flatten with a fork creating a criss-cross design. Bake 10-12 minutes until brown. If you under bake until lightly brown you will have a soft cookie but if you like a cookie with a crisp crunchy taste bake at the higher time until brown. 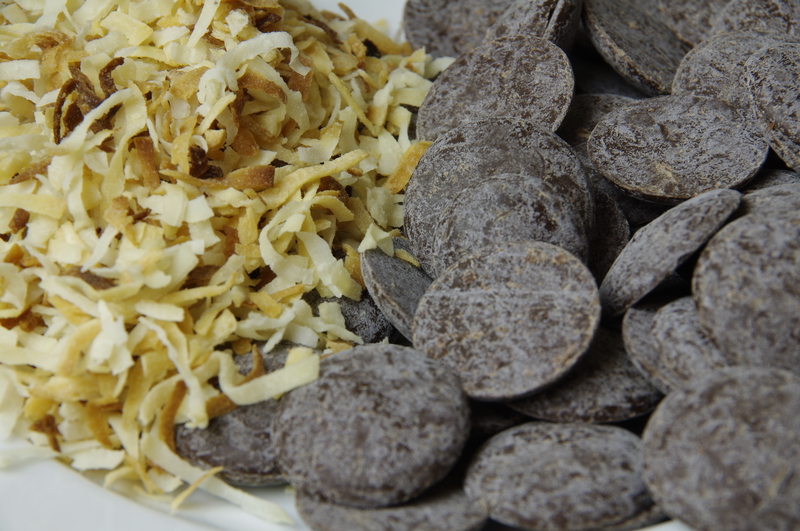 When cool melt chocolate and drizzle over the cookies and immediately sprinkle with the toasted coconut. 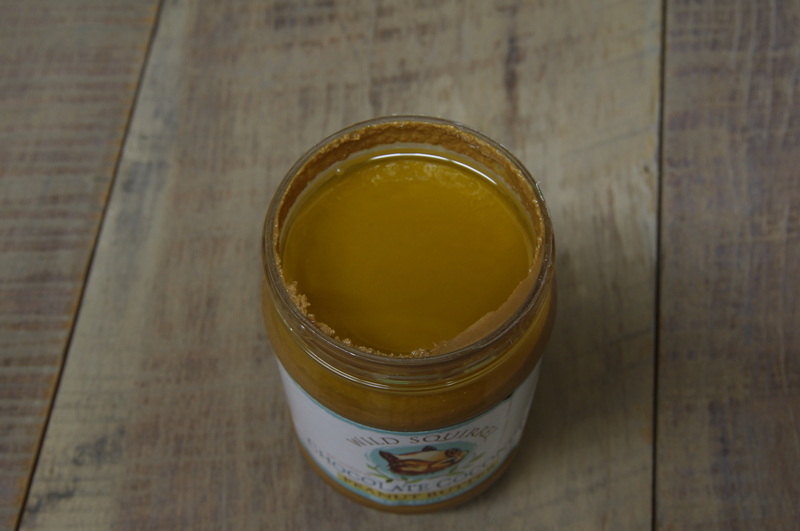 Tip: Make sure you fully mix the peanut butter when you open the jar, you will see the oil is separated and laying on the top.